As part of the South African National Survey of Arachnida (SANSA) in conserved areas, arachnids were collected in the De Hoop Nature Reserve in the Western Cape Province, South Africa. The survey was carried out between 1999 and 2007, and consisted of five intensive surveys between two and 12 days in duration. Arachnids were sampled in five broad habitat types, namely fynbos, wetlands, i.e. De Hoop Vlei, Eucalyptus plantations at Potberg and Cupido's Kraal, coastal dunes near Koppie Alleen and the intertidal zone at Koppie Alleen. A total of 274 species representing five orders, 65 families and 191 determined genera were collected, of which spiders (Araneae) were the dominant taxon (252 spp., 174 genera, 53 families). The most species rich families collected were the Salticidae (32 spp. ), Thomisidae (26 spp. ), Gnaphosidae (21 spp. ), Araneidae (18 spp. ), Theridiidae (16 spp.) and Corinnidae (15 spp.). Notes are provided on the most commonly collected arachnids in each habitat. CONSERVATION IMPLICATION: This study provides valuable baseline data on arachnids conserved in De Hoop Nature Reserve, which can be used for future assessments of habitat transformation, alien invasive species and climate change on arachnid biodiversity. The South African National Survey of Arachnida (SANSA) was initiated in 1997 to record the biodiversity of arachnids in South Africa (Dippenaar-Schoeman & Craemer 2000). As part of this initiative, surveys are underway in various conservancies, agroecosystems, provinces and biomes. So far, only two long-term surveys have been carried out in Western Cape Province conservancies, namely of the spiders of the Karoo National Park, falling within the Nama Karoo biome (Dippenaar-Schoeman et al. 1999), and the Swartberg Nature Reserve, falling within the Succulent Karoo biome (Dippenaar-Schoeman et al. 2005). These two surveys indicate a moderately high diversity of spiders in these conservancies, with 116 species (38 families) and 186 species (45 families) recorded from the two reserves, respectively. The Cape Floristic Region comprises unique vegetation types such as fynbos, which are characterised by high levels of plant endemism. According to Linder (2005) some 9,000 species can be found in the region in an area of approximately 90,000 km2. Although the factors influencing insect abundance and diversity in this biome have been well studied (e.g. Giliomee 2003; Procheş & Cowling 2006; Wright & Samways 1996, 1999), little is known on the diversity of arachnids in the Fynbos Biome. Coetzee et al. (1990) studied the spiders associated with five proteaceous plant species, Visser et al. (1999) studied the arachnids associated with Protea nitida Mill., and Sharratt (2000) included arachnids in their assessment of the conservation status of cave-dwelling arthropods of the Cape Peninsula. The general lack of information regarding arachnid diversity, as well as that for many other invertebrate groups in the Western Cape Province, is a great hindrance to effective conservation planning. Conservation strategies should not only take into account plants and vertebrates, but also need to recognise the role that invertebrates play in ecosystem functioning. Arachnids, with the exception of some phytophagous and parasitic Acari, form an important group of predatory terrestrial arthropods that feed on a wide variety of prey using a range of capture methods, including webs and active hunting strategies. Arachnids are frequently regarded as suitable candidates for studying ecological processes, as 1) they are diverse and abundant, 2) they can be easily sampled, 3) they are functionally significant in ecosystems as predators, and as food for other predators, and 4) they interact with their abiotic and biotic environment in a manner that reflects ecological change (Churchill 1997). Therefore, arachnids can be used to monitor ecosystem stability and changes over time, making them useful organisms in long-term conservation planning. Since fynbos vegetation, which is largely endemic to the Western Cape Province, is under increasing threat from urbanisation, agriculture, alien invasive species and climate change (e.g. Picker & Samways 1996; Richardson et al. 1996; McNeely 2001; Midgley et al. 2003; Witt & Samways 2004), arachnids provide an alternative taxonomic group to monitor changes in this unique vegetation type. The present paper aims to report on the diversity of arachnids (excluding the Acari) in the De Hoop Nature Reserve (DHNR) in the Western Cape, which consists of large areas of pristine fynbos and protected marine habitats. Apart from its value as a biodiversity and conservation tool, this checklist can thus be used as a baseline to assess impacts of the aforementioned effects on biodiversity in areas surrounding the reserve. This study forms part of the South African National Survey of Arachnida in conserved areas and the Fynbos Biome, and also contributes towards the checklists of species of the Western Cape Province. 1. Fynbos (FB)  the largest portion of the reserve contains typical fynbos vegetation characteristic of this particular floral biome (Figure 2). An upper vegetative layer consisting primarily of taller Protea spp. (P. aurea potbergensis Rourke, P. obtusifolia H.Buek ex Meisn. and P. repens (L.) L.) is found in certain areas, particularly near hills and mountains. The field layer comprises a high diversity of fynbos plants, including Agathosma spp., Cliffortia spp., Leucodendron spp., Phylica spp., Serruria fasciflora Salisb. ex Knight and Thamnochortus spp..
2. Eucalyptus plantation (EP)  two large plantations at Potberg and Cupido's Kraal consist primarily of Eucalyptus camaldulensis Dehnh., with endemic low-growing shrubs (e.g. Carissa bispinosa (L.) Desf. ex Brenan) and other short vegetation (Agaranthus sp., Asparagus falcatus L., Bidens sp., Cynodon dactylon (L.) Pers. and Sansevieria hyacinthoides (L.) Druce) (Figure 3). 3. Wetlands (WL)  a single inland wetland, i.e. the De Hoop Vlei, is situated in the south-west of the reserve (Figure 4). The wetland is separated from the ocean by coastal dunes, and therefore does not form a lagoon per se. The De Hoop Vlei is fed by water from the Zout River, the catchment of which receives most of its rainfall during the winter rainfall season. The shores of the wetland are dominated by Sarcocornia spp. and Exomis microphylla (Thunb.) Aellen., with scattered patches of the reed Phragmites australis (Cav.) Steud.. Beyond the shoreline the dominant vegetation includes Sideroxylon inerme L. trees and a variety of fynbos species. 4. 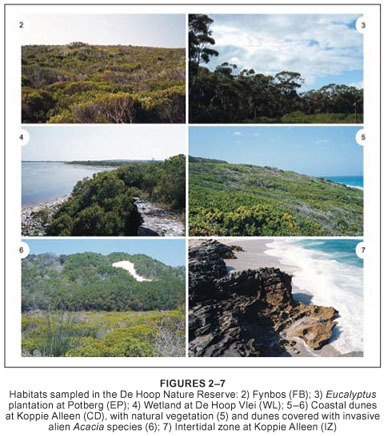 Coastal dunes (CD)  coastal dune vegetation is found along the entire coastline of the reserve (Figure 5). Sea-facing dunes consist primarily of endemic shrub species, including Carissa bispinosa, Cynanchum obtusifolium L.f., Euclea racemosa Murray, Passerina rigida Wikstr., Ptaeroxylon spp., Robsonodendon sp., Rhus glauca Thunb. and Secamone spp., interspersed with shorter species such as Arctotheca populifolia (P.J.Bergius) Norl., Asparagus falcatus, Bassia diffusa (Thunb.) Kuntze, Chironia baccifera L., Dasispermum suffruticosum (P.J.Bergius) B.L.Burtt, Gazania krebsiana Less., Limonium scabrum (Thunb.) Kuntze, Plantago crassifolia Forssk., Silene primuliflora Eckl. & Zeyh., Spirobolus sp., Trachyandra ciliata (L.f) Kunth and fynbos vegetation. Many dunes are strongly overgrown with invasive alien plant species such as Acacia cyclops A.Cunn ex G.Don and A. saligna (Labill.) H.L.Wendl. (Figure 6), occasionally interspersed with fynbos elements. 5. Intertidal zone (IZ)  this habitat includes all rocky shores along the coastline and the vegetation immediately associated with the high tide breaker line (Figure 7). On the rocky shores themselves, various marine algae dominate, while plants associated with the high tide mark include scattered fynbos insertions and coastal dune shrubs. Intensive sampling for arachnids was carried out during five visits to the reserve. Three of the trips were carried out during early autumn (March 1999  April 1999, 2004 and 2005) and lasted 10  12 days each, the fourth trip was undertaken during the middle of winter (July 2005) and lasted four days, and the last trip took place in spring (September 2007) for two days. Sampling was undertaken ad hoc in each of the habitats by active searching under rocks, logs and in leaf litter, beating foliage, sifting leaf litter and sweeping low-growing vegetation. Additional sampling was conducted by searching under bark in the EP, as this was the only habitat in which loose bark was available. Material was preserved in 70% ethanol for sorting and identification. Due to time and logistical constraints during the sampling trips, material was not collected quantitatively (i.e. according to a set sampling protocol). Thus, the sampling intensity varied considerably between habitats with a bias towards collecting in FB and EP, as these were the easiest habitats to access. However, adequate sampling was conducted in the other three habitats using various methods to give a good indication of the arachnid diversity of each. All arachnids were grouped into guilds based on the typical habits known for each family or genus, but also took into consideration the strata in which each species was sampled. All arachnid orders collected, with the exception of spiders, can be classified as wanderers. Spiders can be separated into wandering and web-building guilds. The wandering arachnids can be broadly separated into ground wanderers (GW) and plant wanderers (PW). For the latter group, distinction was made between spiders associated with foliage (PWF) of plants and those associated with the bark of trees (PWB). Web-building spiders can be separated into various guilds based on the types of webs they construct, namely orb-web builders (OWB), funnel-web builders (FWB), sheet-web builders (SWB), space-web builders (SpWB), hackle-web builders (HWB) and gum-foot-web builders (GWB). Representative specimens of each species are deposited in the institutions of the various specialists listed in the Acknowledgements, who provided identifications for their respective groups. Material of all the remaining taxa is deposited in the National Collection of Arachnida at the Plant Protection Research Institute, Pretoria, South Africa. A total of 274 species of arachnids were collected in DHNR, representing five orders, 65 families and 191 determined genera (Table 1, Appendix 1). The most species rich order was the Araneae, with 252 species in 54 families. This includes one published record of a species that was not collected in the current survey, Nephila fenestrata Thorell (Nephilidae) (Fromhage et al. 2007). The spider family diversity represents the highest from South Africa, exceeding the 46 families collected in the Western Soutpansberg in Limpopo Province (Foord et al. 2002) and Ndumo Game Reserve in KwaZulu-Natal (Haddad et al. 2006). The relatively high spider diversity from fynbos is impressive when compared to more structurally complex habitats such as savanna, where greater species diversity could be expected (see Table 2). The remaining arachnid orders were relatively poorly represented, the most species rich being the Pseudoscorpiones (nine species, five families), followed by Opiliones (eight species, three families), Scorpiones (four species, three families), and Solifugae (one species, one family). One published record of Scorpiones, of Parabuthus planicauda (Pocock) (Buthidae), was found in the literature (Prendini 2004). As in several other South Africa surveys, Salticidae were the most species rich family (32 spp., 12.7% of spiders), followed by the Thomisidae (26 spp., 10.3%) and Gnaphosidae (21 spp., 8.3%). Several other families contributed 5% or more of the spider species: Araneidae (18 spp., 7.1%), Theridiidae (16 spp., 6.3 %) and Corinnidae (15 spp., 6.0%). In contrast to some other reserves previously sampled in South Africa, such as the Ndumo Game Reserve in KwaZulu-Natal, the family composition of spiders was considerably less skewed in the current study (Figure 8). At Ndumo, the five dominant spider families contributed 52% of the species, with the Salticidae dominant (82 spp., 19.0%) (Haddad et al. 2006). In contrast, the five families dominating the current study contributed 44.7% of the total spiders, with the dominant Salticidae only contributing 12.7% of the total. The majority of the arachnid species collected in DHNR are wanderers (73.0%), while web-builders comprise 27.0%. When spiders alone are considered, 70.6% are wanderers while 29.4% are web-builders. This compares well with several surveys completed in South Africa (Table 2). This indicates that fynbos and associated habitats sampled in this study are sufficiently heterogeneous to support a fauna similar to that found in more structurally complex habitat types, such as savanna. Ground wanderers: A large proportion of the species collected are wandering arachnids on the soil surface (Appendix 1). The coastal dune (CD) fauna was largely dominated by Pardosa and Trabea spp. (Lycosidae), Griswoldia robusta (Simon) (Zoropsidae), Opopaea speciosa (Lawrence) (Oonopidae), Zelotes anchora Tucker (Gnaphosidae), Natta spp. (Salticidae), Diores simoni O. P.-Cambridge (Zodariidae) and Orthobula infima Simon (Corinnidae). In the Eucalyptus plantation (EP), various gnaphosids (especially Zelotes, Camillina and Xerophaeus spp. ), Caponia capensis Purcell (Caponiidae), Opopaea speciosa, Xysticus lucifugus Lawrence (Thomisidae), Griswoldia robusta and Phanotea digitata Griswold (Zoropsidae), Lepthercus rattrayi Hewitt (Nemesiidae), various lycosids, Fuchiba and Fuchibotulus spp. (Corinnidae) and Drassodella vasivulva Tucker (Gallieniellidae) were common. Opistacanthus capensis Thorell (Liochelidae) and Uroplectes lineatus (C. L. Koch) (Buthidae) were often collected under logs and rocks. The fynbos (FB) fauna was dominated primarily by lycosids (particularly Pardosa, Trabea and Zenonina spp. ), Drassodella vasivulva, various gnaphosids (Camillina, Xerophaeus and Zelotes spp. ), Philodromus guineensis Millot and Suemus punctatus Lawrence (Philodromidae) and Afrilobus sp. (Orsolobidae). Large numbers of Pseudoscorpiones were collected by sifting leaf litter of Protea spp.. The fauna at De Hoop Vlei (WL) was strongly dominated by gnaphosids (Zelotes and Xerophaeus spp., and Drassodes ereptor Purcell), lycosids (Geolycosa and Pardosa spp. ), and Heliophanus spp. (Salticidae). Various gnaphosids, corinnids and pseudoscorpions were common in sifted leaf litter of Sideroxylon inerme (milkwood) trees near to the wetland. In the intertidal zone (IZ), only two species were particularly common. Amaurobioides africanus Hewitt (Anyphaenidae) was commonly found in retreats constructed in sandstone formations at the back end of the intertidal zone, while Desis formidabilis (O.P.-Cambridge) (Desidae) was occasionally collected from beneath limpet shells and between algae on the rocky shores. These two species are regarded as marine specialists, occurring only in association with the intertidal zone along rocky shores (Lamoral 1968). Ground web-builders: Web-builders were generally uncommon on the ground surface, but several species can be singled out. In CD leaf litter, Hahnia spp. (Hahniidae) were frequently found in their sheet-webs, while in FB leaf litter, Benoitia ocellata (Pocock) (Agelenidae) and various linyphiids were common. Lamaika sp. and Vidole capensis (Pocock) (Phyxelididae) were frequently collected in leaf litter and under logs in the EP. The most common web-builders in the WL were Steatoda capensis Hann and Euryopis sp. 1 (Theridiidae), while very few web-builders were collected from the ground level in IZ. Arachnids associated with bark: Due to the vegetative structure of fynbos, very few large shrubs and trees are found in most of the habitats sampled. Only the EP contained Eucalyptus trees that were large enough to sample arachnids from under bark. Common wandering arachnids collected include Clubiona spp. (Clubionidae), Aneplasa sculpturata Tucker, Poecilochroa anomala (Hewitt) and Upognampa aplanita Tucker (Gnaphosidae), Pseudicius spp. and Menemerus bivittatus (Dufour) (Salticidae), Platyoides quinquedentatus Purcell (Trochanteriidae), Cetonana martini (Simon) (Corinnidae) and Uroplectes lineatus (Buthidae). Dominant web-dwelling spiders include Theridion spp. (Theridiidae) and Neoscona subfusca (C.L. Koch) (Araneidae). Interestingly, several specimens of the tree trapdoor spider Moggridgea peringueyi Simon (Migidae) were collected from their silken burrows under bark. Foliage wanderers: The fauna of CD was dominated by Massagris regina Wesolowska and Heliophanus sp. (Salticidae) and predominantly immature Palystes superciliosus L. Koch (Sparassidae). Wandering spiders were quite rare in WL, comprising primarily of Heliophanus spp., various philodromids, and ground-dwelling lycosids (particularly Pardosa spp.) that had wandered onto short vegetation. In EP, various salticids (Massagris regina, Thyene and Heliophanus spp. ), Oxyopes and Hamataliwa spp. (Oxyopidae), Synema spp. (Thomisidae), immature Tibellus minor Lessert (Philodromidae) and Clubiona spp. (Clubionidae) were collected from short shrubs and creepers. The FB plant-dwellers were considerably more diverse. The most common species collected include Chariobas spp. (Zodariidae), various thomisids (Tmarus, Thomisus and Misumena spp. ), and salticids (Thyene and Menemerus spp.). Foliage web-dwellers: Web-dwellers in the CD and FB were particularly dominated by Neoscona and Cyclosa spp. (Araneidae), Theridion spp. and various linyphiids. Several rare species were also collected in the FB and EP, particularly. The only common web-dweller near the IZ was Larinia natalensis (Grasshoff) (Araneidae), which constructs its orb-web in creepers and other vegetation between rocky outcrops surrounding the intertidal zone. This study provides the first intensive data on spider diversity in the Fynbos Biome, although two studies have previously been conducted in this vegetation type (Coetzee et al. 1990; Visser et al. 1999). In total, 274 species of arachnids were collected, with spiders the dominant group (252 species). This diversity represents approximately 12.5% of the currently known South African fauna of approximately 2000 species (Dippenaar-Schoeman & Haddad, unpubl.). While the species diversity is slightly lower than surveys conducted in the Savanna Biome, it compares favourably with studies conducted in the Succulent and Nama Karoo Biomes. The relatively high number of arachnid species collected, and the presence of several fynbos endemics (e.g. 10 of the 15 Corinnidae species), supports the generalised perception that fynbos contains a unique fauna and flora. The only spiders currently considered to be of conservation importance are the baboon spiders, Harpactira cafreriana (Walkenaer) and Harpactirella sp. Both species are relatively common under rocks and within tussocks of Thamnochortis grasses and populations are unlikely to be threatened by occasional collecting. Perhaps also worth noting was the unusual Stasimopes sp. (trapdoor spider), of which only males were collected. These have unusual spine-like tubercles in the eye region, something which could not be traced to any described species in the literature. Consequently, this species may possibly be new or an undescribed male of a described species. The scorpions collected all have a relatively broad distribution within the Western Cape Province (Prendini pers. comm.). For example, Parabuthus planicauda (Pocock) was recorded from DHNR by Prendini (2004), but is widespread throughout the Western and Eastern Cape Provinces. The occurrence of these scorpions within a protected area such as DHNR can be considered important for the conservation of the species, particularly when the growing threats to the Fynbos Biome are considered. In this study several new species and three new genera were collected, some of which have recently been described (Haddad 2006; Haddad & Lyle 2008). This study expanded the distribution ranges known for many species, and provided valuable material for future taxonomic studies. This emphasises the need to expand efforts to survey the arachnid faunas of conservancies throughout South Africa, but particularly within the Western Cape Province, where invertebrate endemism may be relatively high compared to other areas. CapeNature is thanked for permits to collect in the reserve. Peter Chadwick and Keith Spencer at DHNR are thanked for their support and interest in the project. The following taxonomic specialists are thanked for providing identifications of material of their respective taxa: Lorenzo Prendini, American Museum of Natural History, New York, U.S.A. (Scorpiones); Leon Lotz, National Museum, Bloemfontein, South Africa (Miturgidae, Opiliones, Sicariidae); Rudy Jocqué and Mark Alderweireldt, Royal Museum for Central Africa, Tervuren, Belgium (Linyphiidae and Zodariidae, and Lycosidae, respectively); Mark Harvey, Western Australian Museum, Perth, Australia (some Pseudoscorpiones); Wanda Wesołowska, Wrocław University, Wrocław, Poland (Salticidae); and Bernhard Huber, Zoological Institute and Museum Alexander Koenig, Bonn, Germany (Pholcidae). Andor Venter, Johan Venter and Johan du Preez (University of the Free State, Bloemfontein) kindly provided details of the floral composition of the habitats. Several records, collected by Norman Larsen and listed on the CapeNature invertebrate species database for DHNR, are also acknowledged. Germishuizen, G., Meyer, N.L., Steenkamp, Y. & Keith, M. 2006. A checklist of South African plants. Pretoria: SABONET. (South African Botanical Diversity Network; report no. 41. [ Links ]).